"I would like to thank your company and you personally for doing such a good job on the ornamental metal work for the Planter Railings at the John F. Kennedy Center for Performing Arts. You and all of your employees on the project were a pleasure to work with, the quality of the work was excellent, and all of it was done on time under difficult circumstances...."
The Hallmark Iron Works facility encompasses over 4-acres. We feature more than 65,000 square feet of production space and corporate office space. 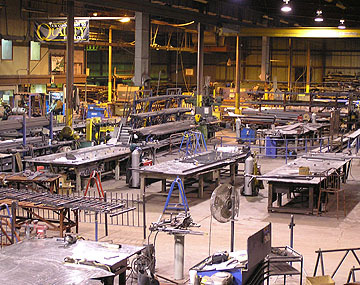 Our facilities provide the capability to produce both miscellaneous and structural steel products. Hallmark Iron works employees over 80 fabrication professionals dedicated to providing the highest quality products available. © 2011 Hallmark Iron Works Inc. All Rights Reserved.